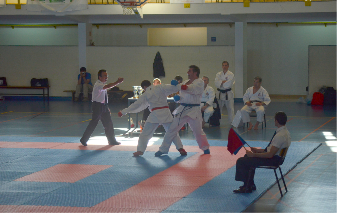 On the day many of Wadokais finest were battling it out in Leicester for a place on the England Squad for the European Championships, Wadokai Portugal were hosting the first ever Sakagami Cup Tournament. The cup pits fighters from Wadokai Portugal against their counterparts from England in honour of the 8th Dan President of Federation European Wadokai, Sakagami Sensei. Founder and organiser of the tribute tournament Frederico Silva said that he hoped this inaugural competition would grow by reputation to include other European countries who would meet annually to pay tribute to Sakagami. He added that he wished the tournament to become “as respected as the Sensei in who’s honour it is held”. In it’s infancy the cup is only open to male seniors (although Sensei Silva hopes to have more categories in the future) so this lone female reporter boarded a plane to Lisbon to spend the weekend with three of Wadokai England’s talented and enthusiastic karateka; Leicester Karate Association’s Junaid Mulla, and Shizen-Do Kai’s Keenan Pedley & Jon Lefevre. 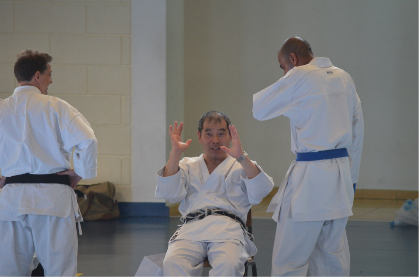 We were also lucky enough to be joined by Sensei Pedley’s father Ed, who kept us youngsters (!) in-check during our 4 days mini-break. After finding our feet in the city and on a high from England’s 3-2 football win against Sweden, we headed to the venue on Saturday morning confident of giving our Portuguese opponents a good fight and an excellent display for Sakagami Sensei. With only two countries competing for the trophy the pressure was on, this was not just competing for gold or silver but one where our boys would either win or lose. Keenan (acting as coach for the weekend) revved us up with talk of the importance of winning an inaugural tournament match, telling us of the Shito-Ryu Sato Cup. Over the past few years, the Sato Cup has established itself as the premier Shito-Ryu competition in the Pacific Northwest and is named in honour of one of Canada's leading Martial Artists. This started as a small invited tournament and grew over the years to be internationally recognised. To be the first ever winners of this cup, Keenan suggested, could be to go down in history! Suitably energised, the three men warmed-up ready for their first bout. The competition was designed as a talent round-robin with each of the three fighters facing each of the three from the opposing side. As a spectator I was to be treated to nine exciting matches of 3 minutes each (or the first to 8 points) and with two only people in the audience supporting England, Ed and I were ready to drown out the fifty or so Portuguese who had come to cheer on their local team. The temperature in the venue had risen uncomfortably since the spectators had poured in, giving the host team a further advantage to that of being on home turf with a partisan crowd behind them. Keenan Pedley was first up for England. 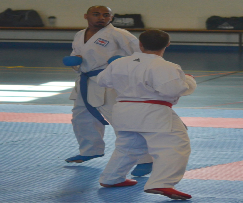 The competitors were well-matched physically and for the first minute the two strategically avoided much confrontation, instead testing out the range and speed of their opponent. This suddenly all changed with Pedley landing his first point and proceeding to surgically picked apart his opponents defence, losing only 2 points and landing 6 to win the match. Junaid Mulla faced a heavier opponent in his first bout but managed to build up a four point lead before the Portuguese man landed a ferocious mawashi geri to bring the match almost equal. Mulla took time to applaud his opponent before calmly executing three perfect Gyaku zukis in a row to win the match. With a two win lead John Lefevre faced the final fighter of the host nation. A scrappy fighter who had allowed John to settle in to a comfortable draw-in, switch stance and counter manoeuvre which steadily built up his lead. With just a minute to go the Portuguese had adapted and flew in a counter of his own connecting with Lefevre’s head and pausing the match. 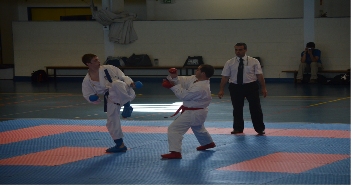 Once restarted John ended with a take down and finish which gave him the narrow lead he needed to win the match. Three fights, three wins for the English and what looked like an uncomfortable climb for the hosts. Despite this the crowd was enthusiastic and cheered on their boys. It should be noted that they supported good techniques from both sides and when the English landed a good point the crowd responded with good humour and polite applause. Mulla’s second fight was less mobile with both competitors focussing more on hand techniques but Mulla had a speed and accuracy that snaked through his opponent’s wider guard and at one point left his rival bent over and winded. Mulla took the match. Pedley still looked fresh at the start of his second bout and steadily built on a relaxed first couple of points with some excellent combinations as his adversary began to tire and drop his guard. A ribcage-clunking mawash from Pedley ended the match but not before Keenan had received one punch to the face that left his brand new Adidas Gold gi covered in blood. With five wins in the bag and the Portuguese without a single match win, the cup was firmly in the hands of the English allowing Lefevre and Mulla to try out their techniques and focus less on building up points. John won his match by 2 points and Junaid narrowly lost his, also by 2. Once Keenan had been patched up by the on-site paramedics he ended the competition on a high, sweeping away his opponent’s exhausted legs to win the match and the tournament. To much flag waving and cheering from us, a delighted England trio held their trophies aloft as they took their place as the first ever winners of the Sakagami Cup. The significant verdict of eight wins to one was testament to the quality coaching of our England fighters at national and domestic level and to the dedication of Keenan, John and Junaid. This is not to demean the Portuguese team who showed some excellent techniques and will certainly be ones to watch in Venice in November. 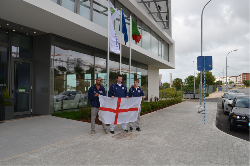 We were also impressed by the quality of the competition as a whole and particularly the high standard of decisive impartial refereeing and judging by our Portuguese hosts. We would like to thank Sensei Silva for his hospitality and graciousness and for organising what we hope will become a major event in the Wadokai calendar in years to come where Wadokai England will no doubt defend their new title.